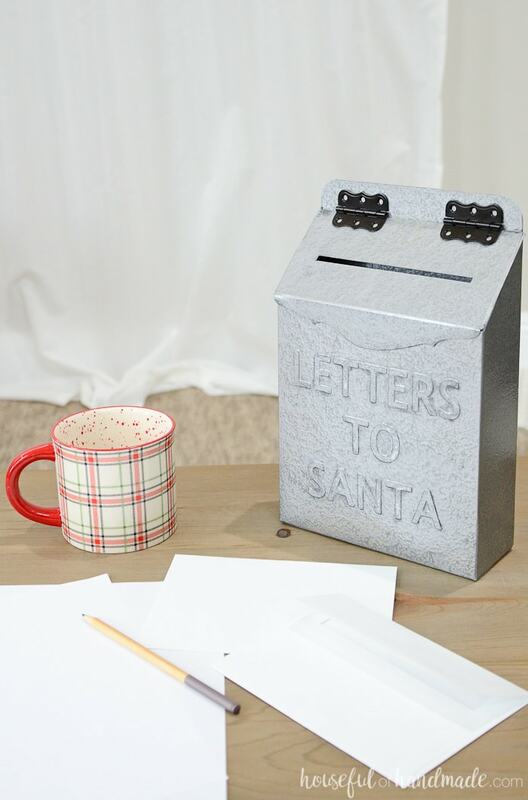 Create a faux metal Letters to Santa mailbox for Christmas with this amazing upcycle. 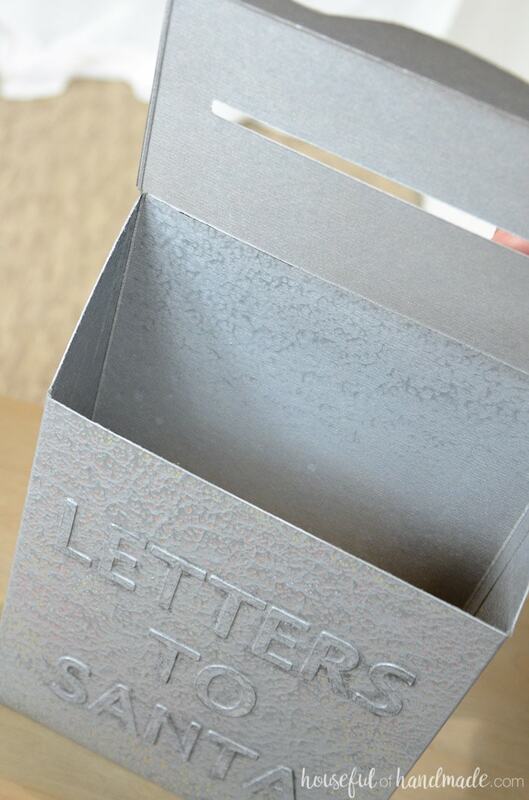 Turn an empty cereal box into a vintage inspired Christmas mailbox. I was at Target last week, killing time and checking out the new Hearth & Hand line. Since I am so excited to decorate for Christmas I was excited to see their Christmas decor. 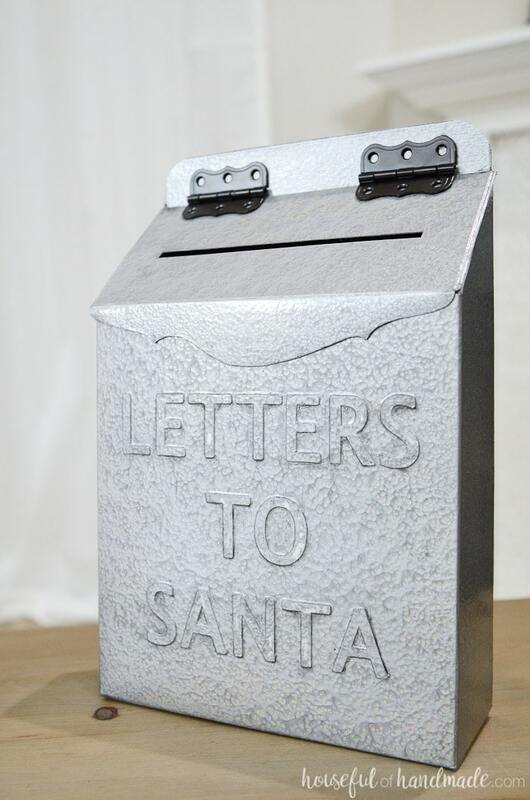 I fell in love with the metal Letters to Santa mailbox. But I didn’t buy it, and when I went back it was sold out. Can you believe this beautiful Christmas mailbox was made from a cereal box? Seriously, I keep touching it to remind myself it’s not actually metal. It turned out so amazing. 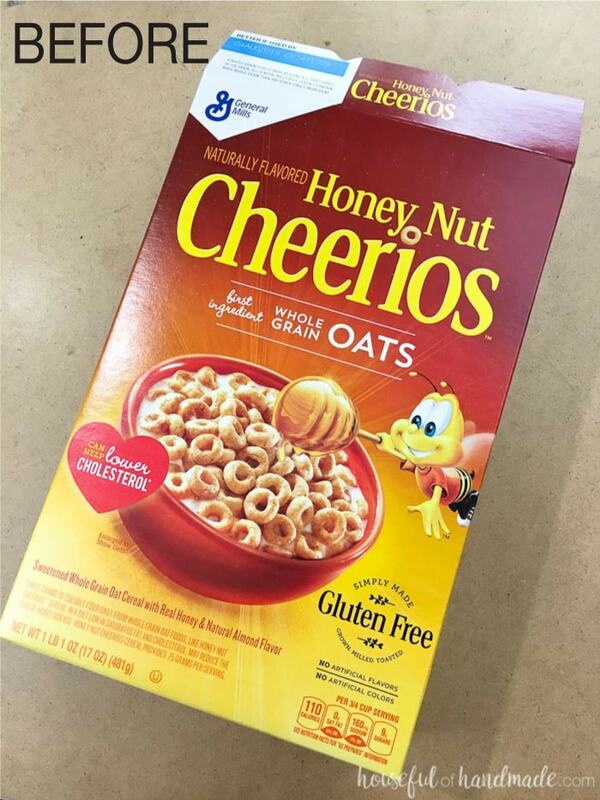 My husband was shocked when I told him it was made out of a cereal box too. The words seriously look like they have been stamped into the metal. And it was so easy to make! 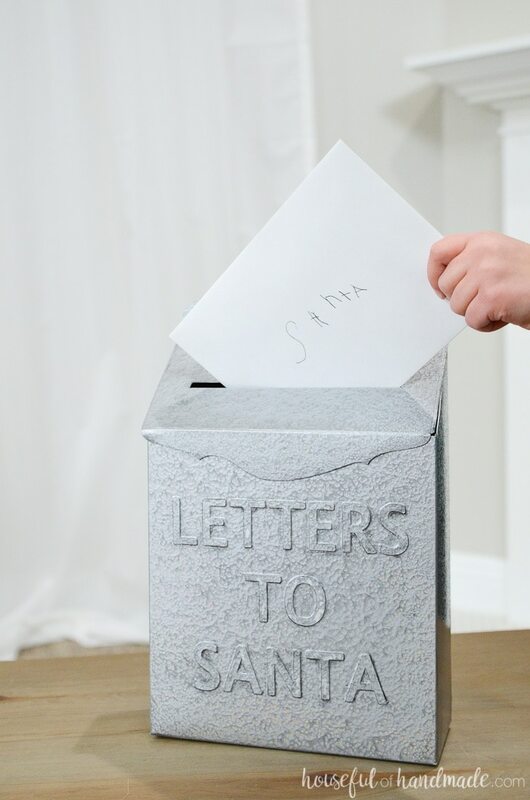 My kids are excited to fill it up with their letters to Santa. I told them I would take them to the post office from this new mailbox so they can get all the way to the North Pole! Christmas with kids is the best thing ever!!!! Now I can’t wait to decorate the entire house for Christmas! 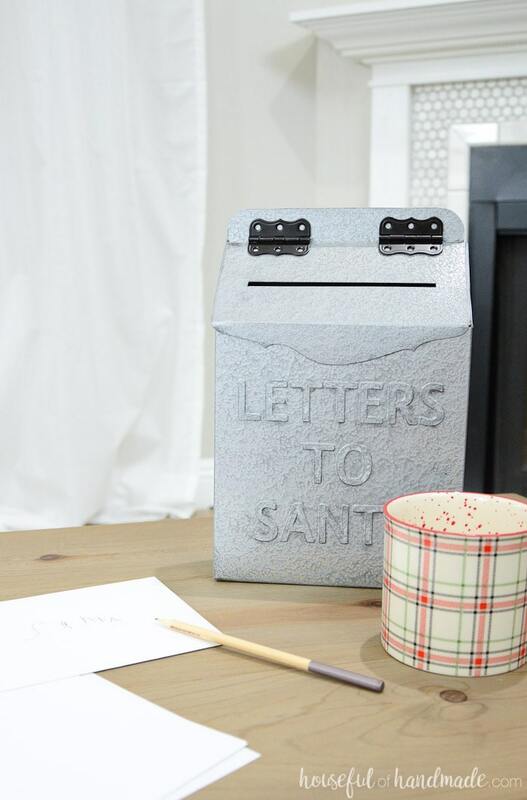 This Santa mailbox was the perfect DIY to start off the season. And I promise so much more will be coming soon! I will be sharing lots of DIYs for our Christmas mantel and I have a bunch of Christmas ornaments to make too. I am so excited for Christmas. How about you? If you want to make your own Letters to Santa mailbox, click the arrow below for the complete (and easy) tutorial. Then don’t forget to check out the rest of my Christmas Decor tutorials. I saw the box at our local Target (although they only had one), and it was cute, but too spendy for me. This is great! That was my thoughts exactly, I like it but too spendy (especially for only being able to use it one month of the year). This was the perfect solution! Love it! Thank you for reminding us that Christmas can be homemade and fun, and inexpensive! What a good time kids will have sending their letters, and imagine their delight when one of their wishes actually appears under the tree! This is such a cute idea. Thanks for sharing. Thanks so much Barb! I love a handmade Christmas. Things are too expensive these days. My kids have already started filling up their mailbox and are so excited to see if Santa brings them what they want. It’s too magical! WOW. I haven’t seen how you made this, but will later on. Just wanted to say that it was adorable!!! The letters look like they are stamped in the metal & so perfectly done. You are amazingly resourceful, good going!! Thanks so much Linda! I love how the letters really look stamped. Omg ,you’re a genius! I fell in love with it too, although I don’t have little ones, So I passed it up.Hope I have time to try this. Thanks ???? Thanks so much Maria! 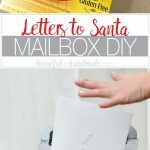 You don’t need little ones to have a letters to santa box right 😉 This one is a perfect substitute for the expensive version!